The other day a huge truck - a 37-plus-ton monster with 14 rows of wheels (8 wheels per row) - got itself stuck on Turnpike road in Brooklyn Township, Susquehanna County, PA. Seems it was on its way to the Williams Central Compressor station and couldn't make the grade. Not only did it require a bit of pushing to get it out of stuck, but it left the road a mess - a road that, according to the residents, the company just "fixed" in order to accommodate their trucks. Frank Finan posted a video of how they finally got the monster truck moving again. This is what traffic looks like, say the locals. Plus they can hear drilling and fracking all around them, so there's never a dull - or quiet - moment. Last week acting Supreme Court justice Robert Wiggins (Livingston County, NY) ruled in favor of the Town of Avon's fracking ban. He cited Court of Appeals precedents and decisions in favor of local bans in the towns of Dryden and Middlefield. This makes the third NY town to win in a court case challenging a town's right to ban fracking. Gas drilling company Lenape Resources sued the Town of Avon and the state Department of Environmental Conservation over the town's moratorium on drilling, saying the action threatened to put it out of business after having operated in the town for decades. Owner John Holko asked for $50 million in damages, and said he'd included DEC in the lawsuit because he felt the agency has a duty to stop towns from enacting local bans. What happens when gas drilling and organic agriculture collide? This series considers some of the issues. Posts are drawn from a 3-part series originally published in New York Organic News (NOFA-NY) in 2012. Research was supported with a grant from SEJ's Fund for Environmental Journalism. Two years ago the Park Slope Food Co-op publicly stated that if hydro-fracking were allowed in New York, they would “research alternatives to New York State products.” The 15,800-member retail food cooperative purchases more than $1.5 million in New York State fruits and vegetables and another $1 million in poultry, beef, lamb and pork. They also purchase NY-made yogurt, cheese, eggs, cider and milk and take their responsibility to “buy local” seriously. Fracking – even if it weren’t on the producer’s farm – would be a deal-breaker. One that, says NOFA-member Ken Jaffe, would have a dramatic effect on his farm. Jaffe raises grass fed beef on hilly pastures in the Western Catskills. 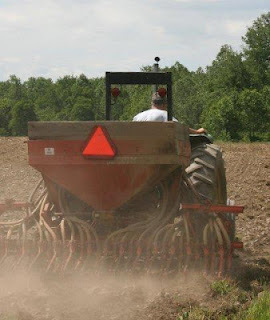 Slope Farm is situated on 100 acres in Delaware County, located near the headwaters of the Susquehanna River and just outside the “no fracking” buffer zone protecting the NYC watershed. He leases another 300 acres of pastures and hayfields and contracts grazing with other farmers. Some of his beef ends up at the Park Slope Co-op and other NYC markets, so Jaffe takes extra care to ensure his cattle are raised well away from drilling areas. But what happens when drilling moves into an area? That’s not a rhetorical question for Jaffe. Just a few months ago he began negotiating a two-year grazing contract with a Tioga County farmer. 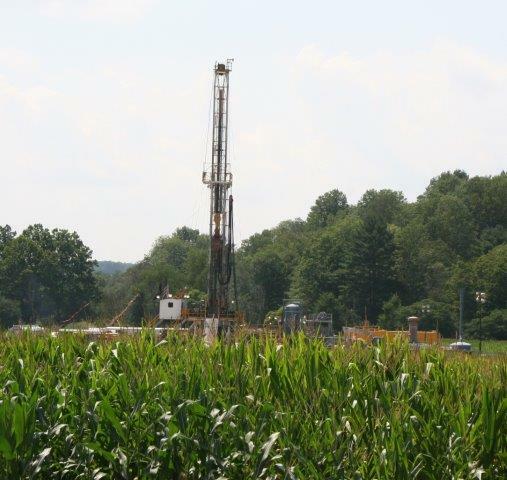 But at the end of September, Houston-based Carrizo Oil and Gas started drilling an exploratory Marcellus well in Owego, NY. Now Jaffe’s re-thinking that contract, especially since Governor Andrew Cuomo has already indicated that he’d allow horizontal hydro-fracking Tioga and four other Southern Tier counties. The primary concern for Jaffe’s buyers is what’s in the meat. “No one at the regulatory level is investigating this,” he says, disbelief in his voice. He cites the Pennsylvania case where 28 cows were quarantined after exposure to drilling fluids. No one, to his knowledge, has looked for any chemical residues in those animals. The proximity of gas drilling chemicals and waste fluids to food production raises questions about the safety of grain and vegetables as well as the meat, eggs and dairy products. Not only is there no federal funding for research on the impacts of chemical contamination on food, there are also no required tests for contaminants. Testing won’t make much difference, though, if there’s a perception that food comes from a contaminated place, says Stefan Senders. Two years ago he started Wide Awake Bakery in upstate NY. Production is small – between 500 to 700 loaves a week – but the focus, Senders says, is to nurture a local economy. One neighbor grows the organic grains, another neighbor mills them, and Senders bakes them into wholesome loaves. Healthy soil is vital for organic farming, but drilling and related activities can compromise soil health. Four years ago a nursery owner in Texas lost 500 oak seedlings when a pipeline used to transfer brine to an underground injection well leaked. Brine is the salty well waste fluid that flows out of shale after drilling. But there’s more than salt in brine; there’s also benzene, heavy metals and radioactive compounds. XTO Energy, the company responsible for the leak, ended up trucking more than 3,000 cubic yards of contaminated soil to a regulated landfill. The shale oil rush in North Dakota has brought soil trouble to farmers, too. Like Marcellus, the Bakken shale must be fracked to release the hydrocarbons. Like shale gas wells, fracked oil shale wells produce briney waste fluids that must be hauled to underground injection wells. But recent data shows that a lot of that waste never makes it to regulated disposal sites – it is spilled or dumped along the way. Last year there were 1,000 “accidental releases” of waste fluids and additional unreported releases along the roads. These spills have sterilized acres of farmland. One spill alone covered 24 acres with 2 million gallons of brine. A year after remediation efforts, nothing grows on that land. Not even weeds. Leaking pipelines can impact crops, too. Methane and other hydrocarbons leaking into soil displace air, thus depleting the oxygen. That in turn can change soil pH, and influence the microbial habitat. The result is severe retardation of crop growth, and sometimes early senescence or death. Air quality is becoming an issue in the gas fields. Rural areas of Wyoming and Utah have measured ozone levels as high as 125 to 140 parts per billion (ppb) – much higher than EPA’s standard of 75 ppb and exceeding the smog levels in Los Angeles. Down in the Texas Barnett shale ozone levels reach 135 ppb, and in Fort Worth gas drilling produces as much ground-level ozone as all the cars and trucks in the city. 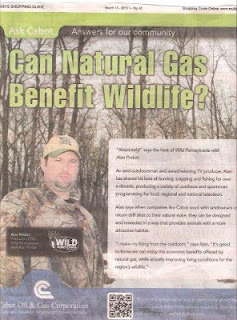 Though we don’t have shale gas drilling, NY is not immune. Chautauqua County, home to about 6,000 gas wells, boasts the second highest ozone level in the state. Where is all this ozone coming from? Emissions from drilling pads, truck traffic servicing those pads, and the compressors and other equipment related to drilling. The Clean Air Act regulates ozone, but the oil and gas industry enjoys exemption from those regulations. Up in the atmosphere ozone is beneficial, protecting the earth from harmful ultraviolet rays. But at ground level it’s a major pollutant, causing more damage to crops than all other air pollutants combined. Each year it’s responsible for an estimated $500 million reduction in crop yields – and that’s just in the United States. Ozone is created by chemical reactions between nitrogen oxides and volatile organic compounds (VOC) in the presence of sunlight. It enters leaves through stomata during normal gas exchange, like oxygen, but is more reactive. It can cause spotting and bleaching of leaves, affecting plant growth, flowering, fruiting and yield. Ozone damage can make some crops unmarketable, as in the case of spotting on spinach leaves. Grapes are particularly sensitive to ozone, says Art Hunt, owner of Hunt Country Vineyards on the north western shore of Keuka Lake. Before the Clean Air Act went into effect, air pollution caused spots on his leaves. That, in turn, affected vine growth, fruit ripening and yield. Large scale industrialized drilling, he says, could roll back the gains made from clean air regulations. Ozone can also make crops more susceptible to pathogens and pests and, in the case of clover and other crops, retard root growth. For farmers, high ozone levels may mean lower nutritive value of their forage crops. It may alter how well herbicides work, promote the growth of perennial weeds and create opportunities for invasive species to move in. Ozone also affects grains, including wheat and rice, as well as tobacco, soybeans, alfalfa, sorghum and cotton. When Carol French signed a gas lease she never dreamed that half a dozen years later she’d be warning other farmers to think twice. 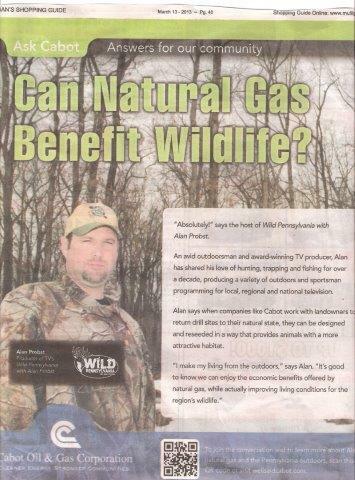 French, a dairy farmer in Bradford County, Pennsylvania, lives in the midst of the drill zone. The last time she counted, there were nine active wells located within a mile of her farm. Carolyn Knapp, an organic dairy farmer, lives just a couple miles away. Six years ago she was concerned that signing a lease might affect her organic status. It didn’t. Now, with a handful of wells drilled nearby, she worries about other ways that gas drilling and exploration could impact her operation. 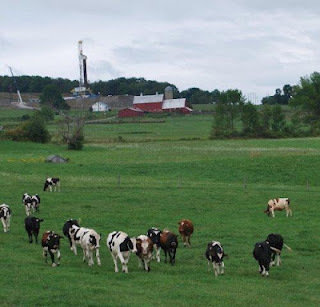 The problem: gas leases do not protect farmland. Once those leases are signed, say Knapp and French, farmers lose control over their land. Gas companies decide where to place access roads, well pads, pipelines and compressors – and that can interrupt normal farming activities. One of French’s neighbors ended up with a well pad sited behind his barn, effectively cutting off easy access to the fields and pasture. The farmer is earning royalties, French said – about $400/month. But he sold his cows because the drilling operations made it too hard to keep on farming. Knapp, who integrates intensive grazing into her dairy operation, said drillers planned to dig a 20-acre water impoundment right in the middle of her rotational grazing system. Agricultural land is hit particularly hard; research shows that in the Marcellus, farmland makes up about 62 percent of the acreage affected by drilling. 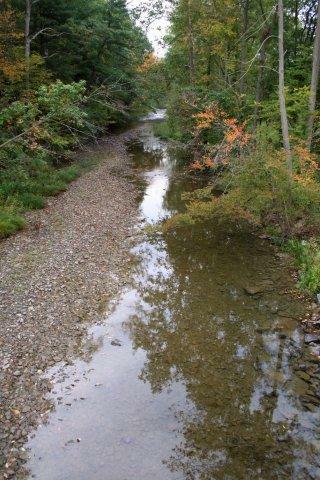 And when Penn State professor Tim Kelsey surveyed Bradford and Tioga counties in PA, his data showed that the number of wells in an area has an impact on farming. Areas with 150 or more gas wells lost 19 percent of their dairy herd; areas with no wells experienced only a 1 percent loss. He doesn’t have an exact number, but Kelsey says there is no doubt that dairy farmers are quitting because of drilling. Even if their own farms are not impacted, farmers face other challenges. Landowners who used to lease fields to farmers are now renting their land for drilling-related uses such as equipment storage and water withdrawal sites. Large impoundments take land out of production, and crop yields are down in reclaimed pipeline right-of-ways. Add to that the scarcity of sawdust for bedding (it’s mixed with drill cuttings before they’re trucked to landfills) and the recent addition of an 8-cent-per- hundredweight surcharge for hauling milk (gas companies pay higher wages for those with CDL licenses) and it’s clear that the Marcellus boom is a bust for some farmers.